Work-trade positions ($375) and Diversity Scholarships for people of color working in the fields of environmental, food, and/or social justice, are available on a limited basis. Please CLICK HERE to apply for a Work Trade or Diversity Scholarship. Collaborative groups may be healing, nurturing, and inspirational—or they may founder on the rocks of conflict and poor communication. In this five-day intensive, we’ll explore how to structure our groups for maximum group health, how to share power fairly, improve our communication skills, mediate conflicts and facilitate group processes. We’ll explore issues of power, privilege and diversity, and how to shift ‘’call-out’ culture to call in understanding, mutual respect and support, and real relationships. And we’ll share tools for decision making and constructive critique. Starhawk’s latest book, The Empowerment Manual: A Guide for Collaborative Groups, will be our foundation. We’ll balance the process work with time outdoors in nature, including hands-on work on the land, as well as walks, bird sits and wilderness awareness. Insights from both permaculture and magic will help us learn to be more effective and joyful as we work together to regenerate our world. A group or organization seeking to make change. A nonprofit or NGO that seeks to work collaboratively. A spiritual circle, ritual group, or faith community. A community group, Transition Town, collective, or worker-run cooperative. An intentional community or household, or hope to start one. A collaborative arts, theater, or music group. A band! A family or a community of friends that want to improve communications and ways of handling conflict. Design the physical to support the social. Working with diversity–race, gender, class, sexual orientation, etc. Group vision: picture of the world, mission, goals and governance. Conflict—embracing, mediating and resolving group conflict. 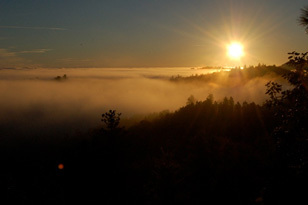 Black Mountain Preserve is in the Cazadero hills area of northern California, in west Sonoma County. The Preserve centers around a complex of dorms, dining room and kitchen, classroom and offices, and is surrounded by 485-acres of forest and coastal hills. Expect a wide variety of natural beauty. Walking trails and unused dirt roads lead off in several adventurous directions, through ecosystems of redwood/fir, oak/madrone, and coastal prairie. You can see the ocean from high points on the property, while a couple of creeks run through in low spots. We have held Earth Activist Training sessions at Black Mountain since 2001; it is currently owned and operated by the Padmasambhava Peace Institute, a Tibetan Buddhist group. At one time Black Mountain was a state camp for petty offenders, but renovations have made it a cozy and comfortable conference center, a real-life swords-into-ploughshares example. There is a Peace Garden and a Rain Garden designed by students from our Permaculture Design Certificate program. Across from our classroom is a beautiful and authentic Buddhist altar room, which is open to registrants for quiet meditation. Black Mountain is primarily accessible by car, and we strongly encourage carpooling. The region is well-served by public and private transit options and we will assist with organizing carpools from regional transit hubs for folks flying in or taking the bus. We will send out a complete welcome packet with plenty of detailed information six weeks prior to the beginning of the course. Our standard housing is included with tuition: several comfortable dorms with beds, for which you can bring your own bedding or rent some from Black Mountain at extra fee. A small number of private single or double rooms are available for an additional fee. Please use your registration form to indicate your preference. Our standard is local, organic, globally-inspired vegetarian-friendly meals, served three times a day, plus afternoon and evening snacks. All food is fresh, plentiful, and substantial. Teas and coffee are available at all times. Please use your registration form to request special meal choices. Meat is served one meal/day for omnivores, while vegan variations are available at every meal. Options such as no-dairy, gluten-free, and avoidance of common allergens are also possible if requested in advance. While we make every effort to accommodate food needs, those with highly specialized diets may need to bring some of their own food. Please indicate on your registration if you have any concerns about the food or to make special arrangements, and our Coordinator will work with you. Late March is one of the most beautiful times in the Cazadero Hills, with emerald-green pastures, wildflowers and fruit trees in bloom, and variable weather—from warm sunny days to rain. We will spend as much time as possible outdoors, and mix intensive magic with immersion in nature. A $375.00 deposit is due with registration in order to secure your space. We accept payment by check, money order, or credit/debit/Paypal.